Instant Pot Bang Bang Shrimp Pasta is going to become an instant favorite. Tender and juicy shrimp smothered in a creamy and spicy sauce, paired with pasta. Skip the takeout from your favorite restaurant and make this homemade bang bang shrimp pasta at home for a fraction of the price. I think it is safe to say my husband is a lover of shrimp. I wanted to use my favorite bang bang sauce paired with pasta to see how we liked it. BOY was this recipe a winning dish in our home. My husband got the savory and tender shrimp, I got pasta that was soaked in the bang bang sauce for that perfect amount of heat. If you have never hand bang bang shrimp, try it, you are totally missing out. Add in the pasta as I did, and you will just upgrade the wow factor of this dish. Bang bang shrimp is generally an appetizer served up, that is sweet and spicy covered shrimp. Bonefish Grill is known for their bang bang shrimp, and let me say, when you make this into a dinner paired with pasta, it really transforms the flavors of the classic bang bang shrimp you know and love. The beauty of this recipe is you can make it lighter on the heat factor or spice it up. The heat isn’t overwhelming like some dishes you might have tried in the past. I recommend using less Sriracha and less crushed red peppers if you want a milder flavor. Now if you like the heat, leave the recipe as is. Once you finish cooking you can test the dish, and if you want more heat just drizzle on the Sriracha and sprinkle on more pepper flakes. Give it a stir and see how the heat feels for you then. I always recommend going light on the heat factor, and adding to it, cause you can’t take the heat away once mixed in. This Bang Bang Shrimp Pasta Dish is Banging! I use my Instant Pot at least three times a week, and I get asked why. If you look at this dish, it takes just 4 minutes to cook, that is incredible! If I did this on the stove top and oven it could take around 20-30 minutes. Plus with the Instant Pot it really helps keep the moisture in the food, so I don’t have to worry about opening my Instant Pot to dried up shrimp, they are cooked to perfection and it soaks up all the flavors of the spices. Since I served my shrimp with pasta you might reach for a dinner roll, steamed vegetables or even a side salad. I personally think this is a meal in one, and doesn’t need much of a side but you are welcome to whip one up if you would like! I hope you love my creative bang bang shrimp pasta recipe. Bang Bang shrimp is one that I keep coming back to over and over again. 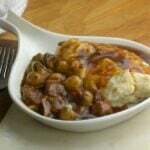 It is such a savory dish that is great for serving guests as well. It offers a pretty presentation value, and the Instant Pot makes it so simple to whip up. We have made this dish for tons of people over the past few years and everyone asks for the recipe. 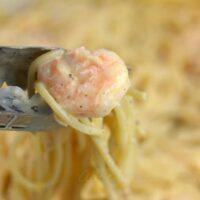 It is truly that good if you are a fan of shrimp and pasta, and a little creamy sauce with a kick. This recipe could be right up your alley! 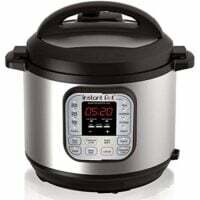 Since I started using my Instant Pot we have had more flavorful dishes, that are cooked incredibly fast, and it makes me and my family happy. Even people who are a bit challenged in the kitchen have found that the Instant Pot allows them to cook meals that are delicious and not burnt! I have so many incredible recipes on my site you should give a try. It truly is a magic pot, it does pretty much everything. 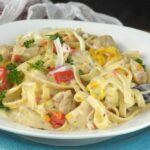 You may also like my Olive Garden Chicken Scampi, Instant Pot Pasta Carbonara, Or even My Instant Pot Beef Tips and Gravy. Don’t wait another minute, give this bang bang shrimp recipe a try! 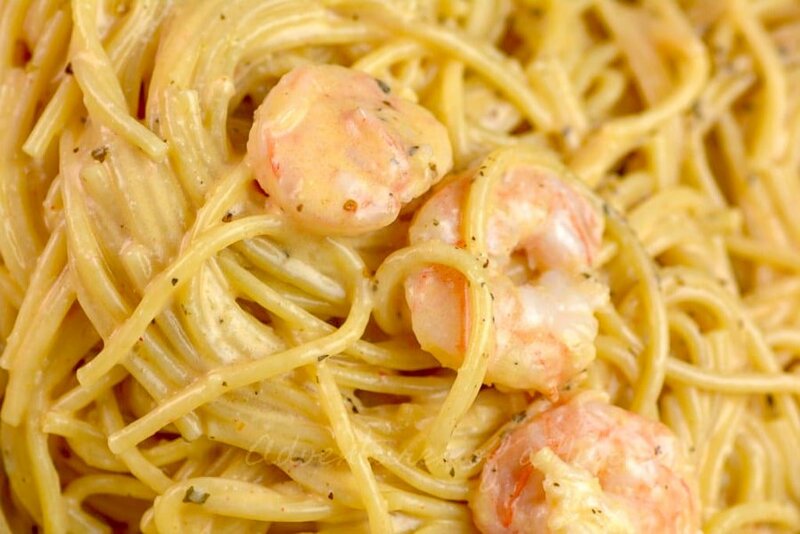 Be prepared to fall head over heels in love with the sauce, pasta, and tender shrimp! Instant Pot Bang Bang Shrimp Pasta is going to become an instant favorite. Tender and juicy shrimp smothered in a creamy and spicy sauce, paired with pasta. Add garlic, paprika, and olive oil. cook for about 1 minute. Break pasta in half and place in the pot. Pour 3 cups water over the top. 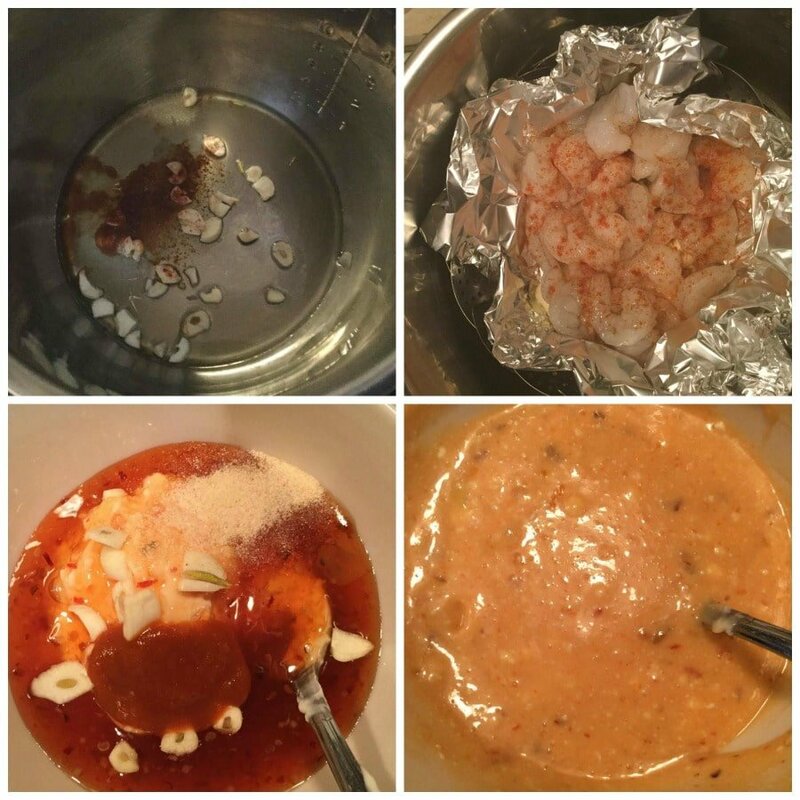 Take a piece of foil and place your shrimp on the foil sprinkle with more paprika and 1 tbs lime juice. Place on top of your pasta right in the pot. While pasta is cooking prepare the sauce by mixing together all ingredients for the sauce. Mix together shrimp, pasta, and sauce. Stir and serve. Enjoy! Next Post → WATCH MAYWEATHER VS. MCGREGOR Free! Can this be made with frozen shrimp? Can I make this with chicken? Like cut up chicken breast? Do you think still cooking it on the foil would be necessary? Any time adjustments for chicken? Made this tonight, in the pot now. Used chicken instead of shrimp because that’s what I had in the fridge. Sautéed them with the garlic to brown. We shall see how it turns out! Thanks for the recipe. In the Bang Bang shrimp, you don’t cook the sauce at all? Thx for the recipes. I’m new to Instant pot. puts out while cooking, so I drained it. Thinking I probably shouldn’t have because the dish is pretty dry. I was hoping the color of mine would have been close to your’s, but no….. mine’s pretty orange. Great effort in providing the recipe, but probably won’t do this one again! If my comment shows a 5 star rating, it’s because the option to rate automatically selects 5 stars and will not let you change it. I’d rate 1.5 or 2.
hummm not sure what happened. I really want to make this! Looks delicious. Do you put the foil directly on the noodles? It looks like you have a strainer in the pot. What is that and when do you put it in? Made this, SO good. I used a little less than a pound of pasta. I did not drain the pasta and it was perfection. Thank you!! We enjoyed this, but my pasta had some really big clumps. And do you get rid of the liquid from the shrimp, or stir it in? My noodles were undercooked as well. I liked the flavor and feel like I can tweak this for next time. Thank you! Flavor was SPOT ON! I omited the red pepper flakes and my kids loved it! I will be doing 1/2 lb pasta (I use an authentic pasta, not a boxed, so not sure if that was denser) and a smidge more liquid, but fantastic recipe!! THANK YOU! I found the suggested cooking time was not long enough to cook a lb of pasta. Once I re-covered the pot to cook it a little longer, I lost most of the steam, and even after cooing it 2 mins longer, the pasta was still tough. But the flavor was good. I will try this again, making some adjustments…. This was my 2nd IP dish and I must say it is delicious! Here’s what I changed to make this for 2 adults…1/2 lb linguini but same amt of water. Next time I will reduce water by 1 cup. Increased cooking time to 6 mins and pasta is perfect with shrimp not over cooked. Minimal trouble with linguini sticking together. I reduced Sriracha to 1 tsp and I’m glad I did! Yum. Will definitely make this again. The more I think about it, I won’t reduce the water with 1/2 lb pasta – it made a lot of sauce that I put left-over beef and that was delicious. The reduction in spices is a must for me…I might even go down to 1/2 Tsp of Sriracha but keep the other spices (and no pepper flakes). This recipe is a keeper and will go into my regular rotation. Made it tonight! Came out great…noodles cooked perfectly and I even had a mix of linguine, spaghetti and fettuccine (so I added 1 minute to cook time). Sauce was great. So, so easy and yummy! My 1.5 year old loved it!! (I halved the Sriacha) And the hubby as well. Will make again! Thanks for the recipe!! Tasty, easy n appetizing dish. Highly recommended. A few questions. Do you use thin or reg. Spaghetti noodles. Do you use raw or cooked shrimp. Would you clarify some of the units for me? I got the tsp = teaspoon and tbsp = table spoon, but which one is the Tsp? I made this tonight and guessed on the measurements and dropped them down a bit out of concern for it being too spicy for my girls, but I would love to know the intended measurements so I can try it that way and then adjust if / as needed. Also, I tried it with frozen shrimp and the 5 minutes is no where near long enough so I am guessing the recipe is for thawed shrimp and needs to be adjusted appropriately for frozen. Really, really good. Spicy, creamy, shrimpy goodness. Thanks for the keeper recipe. Fantastic! Tried this tonight and it was incredible. I love it spicy and this was perfect. Been using the IP for over 4 months now and this recipe is my new favorite. Just finished making and eating this for the first time! Oh my, it was wonderful! I was out of Siracha, so I used some “Green Dragon Hot Sauce” from Trader Joe’s. I also used whole wheat thin spaghetti and increased the cook time 2 minutes. It was perfection! Thanks for the recipe! Used angel hair pasta and noodle was okay but shrimp didn’t cook through all the way. I had to finish on skillet. To be fair I did use large shrimp so I think I will increase cook time by a couple of minutes. Flavor was good and easy to make! Thanks! Hi! 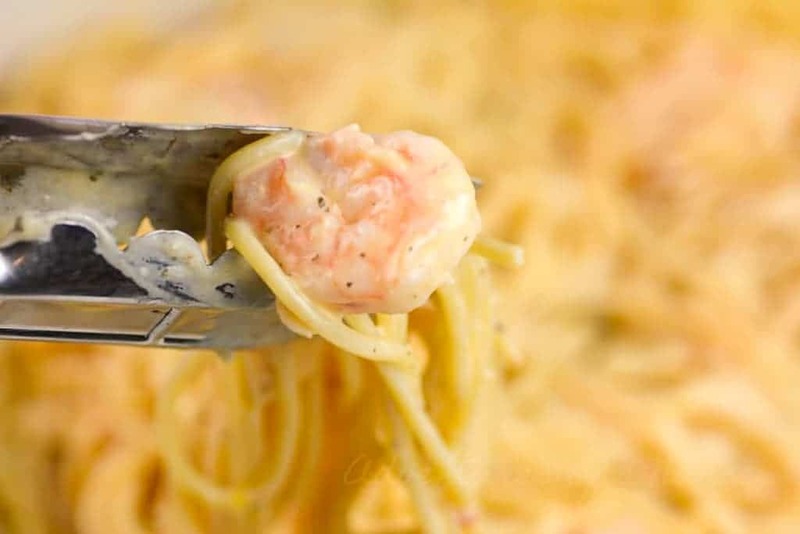 Bang Bang pasta with shrimp sounds wonderful! Would it be possible to substitute something else for the mayo? 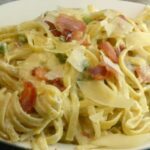 Would heavy cream or sour cream work? I made this recipe today with a few adjustments, based on the comments. I also had frozen cooked shrimp. I adjusted my time to 6 minutes. I tried to make sure I spread out the pasta and separated it as much as I could. I also did not put the shrimp in. After cooking, about 3/4 of the pasta turned out great. Some I was able to separate, but the rest, was not done and stuck together. Looking back, I should have made sure all the pasta was under water and stirred and separated more. I dumped the pasta in a bowl, no need to drain, then put my thawed shrimp in with the lime juice, turned on sauté for a a couple of minutes, just to warm up the shrimp, then dumped everything together and served. Family loved it. I also used a 1/2 teaspoon of siracha and it was plenty hot for me. Super easy and quick. Thanks for the recipe and the comments. making this for dinner tonight? Made this tonight exactly as directed in the recipe. Pasta clumped together in a few spots (I used standard spaghetti). The sauce was pretty good and the shrimp were cooked, but not overcooked. If you are cooking for someone who doesn’t like spicy food, you will need to modify this recipe. I can handle some pretty hot Thai and Indian food, but his was probably a 2.5-3 on a 1-to-5 spicy scale. What kind of shrimp do you use? Or how do you buy it? Please tell me the nutrition statement is for the entire pot and not just one serving. I would love to try this but the amount of fat, cholesterol, sodium and carbs, makes it pretty much impossible for the folks in this household. Made this tonight; liked it (not the biggest bang bang sauce fan, but it was worth a try). Followed recipe exactly, timing worked for me. Would only mention that it may help to give the spaghetti noodles a quick stir after adding water and before pressure cooking; I had some noodles that clumped together so I had to add ~ 3/4 cup water afterwards to break them up. Nice flavor, if I make again I’ll probably add more red pepper flakes. This really didn’t work for us. The garlic & paprika burned to the bottom while cooking the pasta. The pasta was a bit under done. We didn’t care for the sauce. Maybe a bit too much sweet chili sauce. I did use canola mayo instead of regular mayo. I also used canned chicken from costco instead of shrimp. Will try again, but less chili sauce, more water & a little longer cook time. WOW! Was this ever spicy! But we loved it! Maybe next time I add only 1T. of Siracha. What is your favorite shrimp? i made this last night and had no problems with the spaghetti, made sure that the pasta was all covered by water before cooking, and i put the pasta in like a birds nest, not side by side. no problems with it sticking or cooking together. i also omitted a bit of the siracha because my son isnt a fan of hot. you could still feel a bit of heat but not to much. it was very good. i also used 1 1/2 lbs of shrimp and cooked it on high pressure for 6 min. it could have probably cooked for 7. but still a good one. Raw or cooked shrimp? Fresh or frozen?? Do the time and amount of fluid need to be adjusted for 5,500 feet altitude? This was perfect at sea level, but what changes are necessary at high altitude? Made this tonight, soooooo good, I love it, my family thought it was too spicy, perfect for me, next time I guess I’ll cut back a little, sigh… followed recipe as is and had no problems with undercooked pasta or being too dry… I did add the liquid from the shrimp as others were asking if it should be added or drained, I was contemplating draining it, however my tin foil was too weak and added it by default… perfection!!! Is it me or are most of the recipes that deal with pressure cooking confusing on the times. Especially when the chef says it only takes eight minutes to make? Four prep and then four cook. Except it takes two to three for the sauté to start sizzling. Nothing is instaneous. Then when I am ready to pressure cook and put the lid on, and go to pressure cook you have to cancel and click on pressure cool. Then it’s ten or so minutes for pressure to be fully engaged. Then. The four minute timer starts. So. With the above modifications. Did 1/2 lb of pasta. Two cups of water. Added water before noodles, and scraped the sautéed bits of garlic off the bottom and then moved the submerged noodles around. So completely wet and oiled so hopefully they don’t stick. I used one pound of larger 41-50 shrimp. Frozen. Dumped in with frost on them. Ok. Sauce made as described. Timer went off. Quick release. Shrimp was partially cooked. Which made me happy. I was worried of over cooking them. Dumped them into the sauce. Stores the noodles. Some stickage to each and the bottom. But not bad. Some water left. But not too bad. Noodles were al Dante. Good. Stirred in sauce. All good! Hot bubbling sauce finished cooking the shrimp. Only one issue which was my bad. I forgot to peel the shrimp since I just dumped them in front the bag and didn’t notice! Oh well. Still very good. I agree with increasing the cooking time by a minute or two. The noodles were a little too “al dente,” and the shrimp were bordering on undercooked. I added water and sauteed on the stove for a few minutes after pressure cooking. I can’t eat pasta. How can I do this without it? Why bother with the aluminum foil? Wouldn’t it turn out the same if you just put the shrimp on top of the pasta?